Comics, Hone your craft and build your act ! 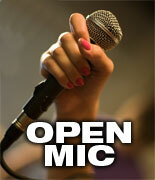 Our Open Mic Night is usually held on the SECOND FRIDAY of each month! Comics get seven minutes of stage time and are required to bring six paying customers. We ask that your act be relatively clean and original. In order to participate, you must sign up by calling the Brokerage at 516-781-LAFF (5233). Please have your audience members make reservations.